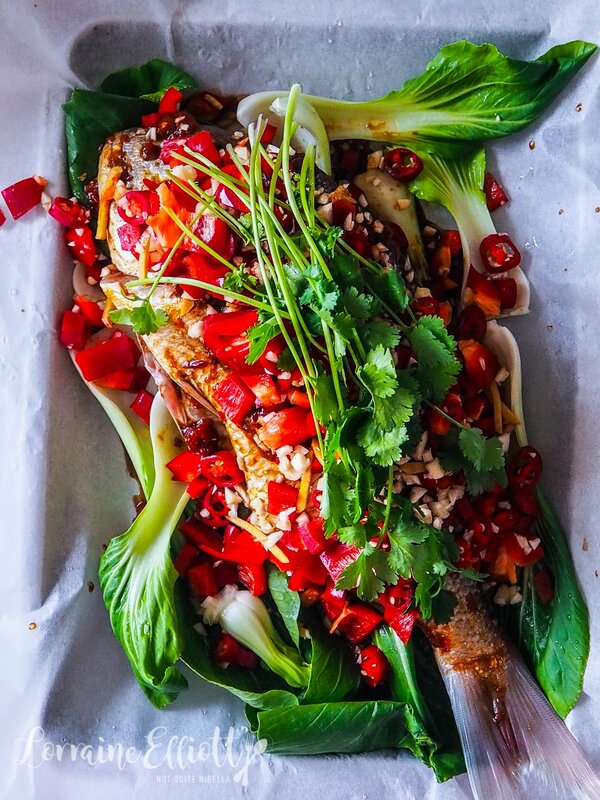 Spicy Paper Bag Chilli Snapper! 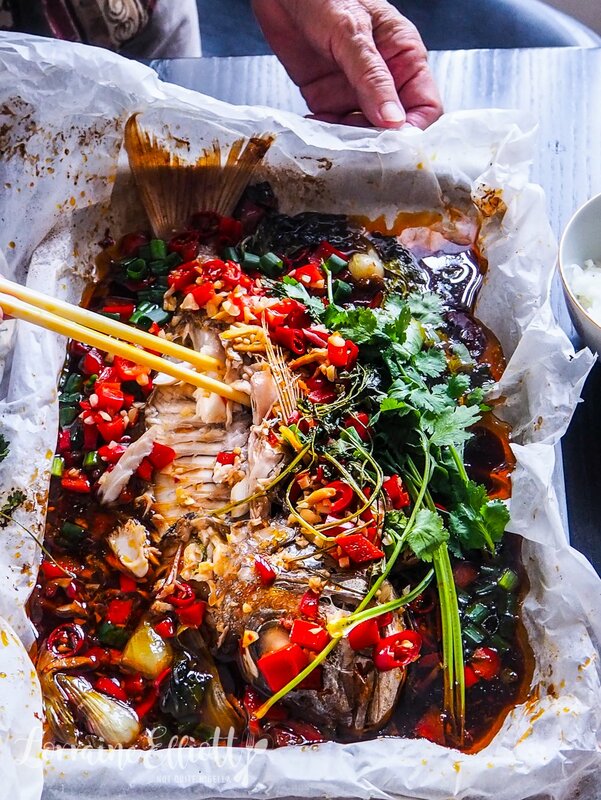 Want a baked whole fish with a powerhouse of flavour to serve guests? This recipe is a dream: it's easy, requires 10 minutes prep and has very little to clean up afterwards and everything is baked in a bag. It's a spicy paper bag snapper! And Dear Reader, this is a definite pushy recipe! 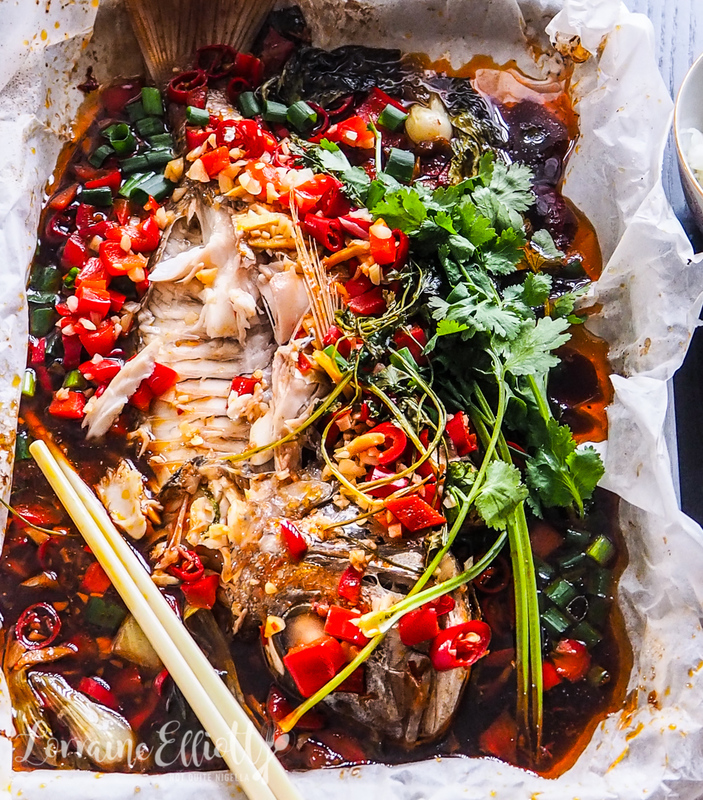 If you are a fan of spicy, bold flavours and moist fish then you have to give this a go. 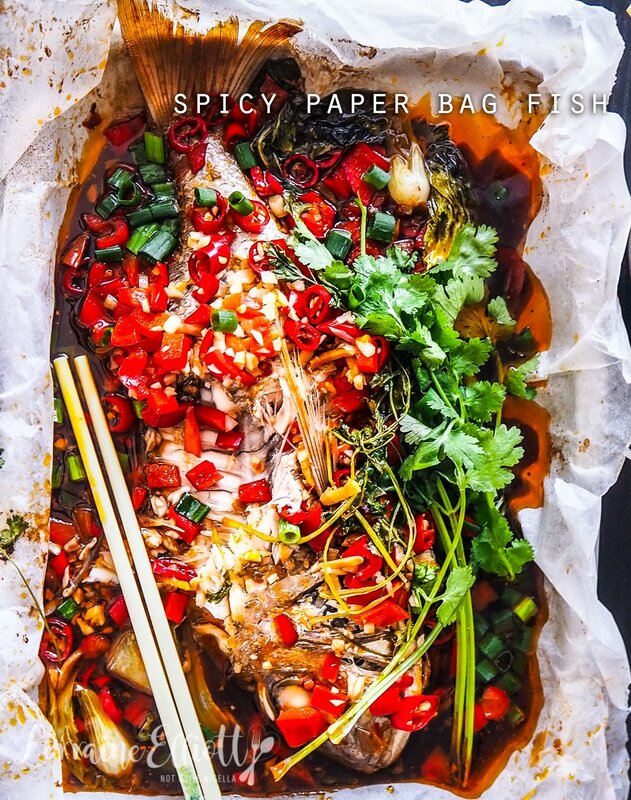 The paper bag parchment keeps the fish deliciously moist. Yes there is a lot of garlic, ginger and chilli in this but I use a little trick to make it seem more ferociously spicy than it actually is. While I use milder large red chillies, I also dice up red capsicum to give it an vividly coloured red covering that makes it look scarier than it actually is. Still, it is not for the chilli fearing or the faint hearted. 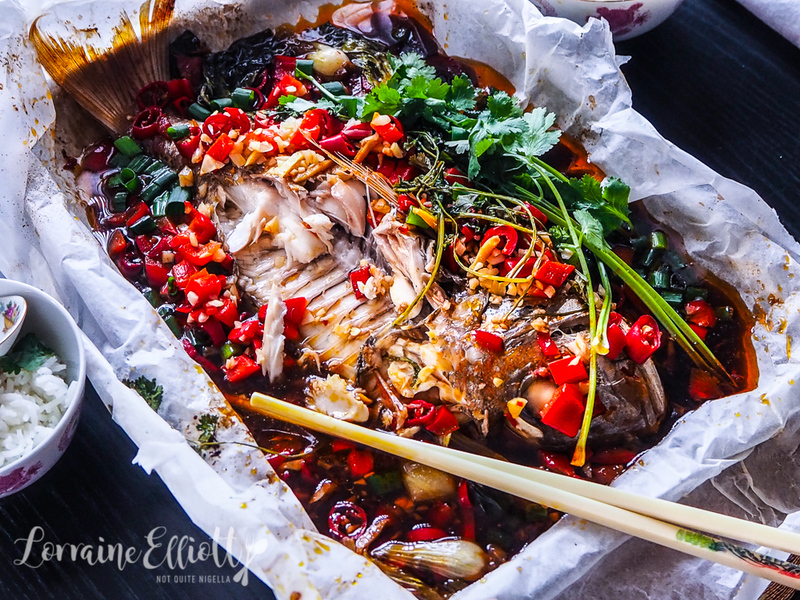 You do have to love strong flavours as I do and if you do, then this fish will be your food nirvana. I have to be pulled away from this dish every time and the sauce is made for steamed rice. If you want to knock someone's socks off and impress guests then this is the dish to do it. It's a bit of theatre and reveal - when it comes out of the oven the sauce in the paper bag bubbles away and you open up and the spicy perfume fills the air. Make sure to save the sauce too as it is incredibly moreish cooked with noodles or in a broth if you have any left over. My mother did wonder if it was only Chinese or Asian families that ate whole fish and mused aloud, "Will other people make it?". I told her that yes a lot of people make whole fish and when I put up a picture of this on Instagram, the number of people from all backgrounds that asked for the recipe confirmed this. My mother loves the fish tail so she took that while I took the head. Even my chilli phobic father was curious. My mother gave him some, "Try try," she said picking up a fat piece of meat with chopsticks and urging him to open his mouth. He scrunched up his face like a baby given something bitter for the first time. "It's hot, it's hot!" he cried out dramatically and shook his head with disapproval. And then he reached over for another fat piece. "I just want to try it again," he said grudgingly. And soon there was nothing left. So tell me Dear Reader, how often do you cook whole fish? Do you have a favourite fish to eat? And can you handle the heat? 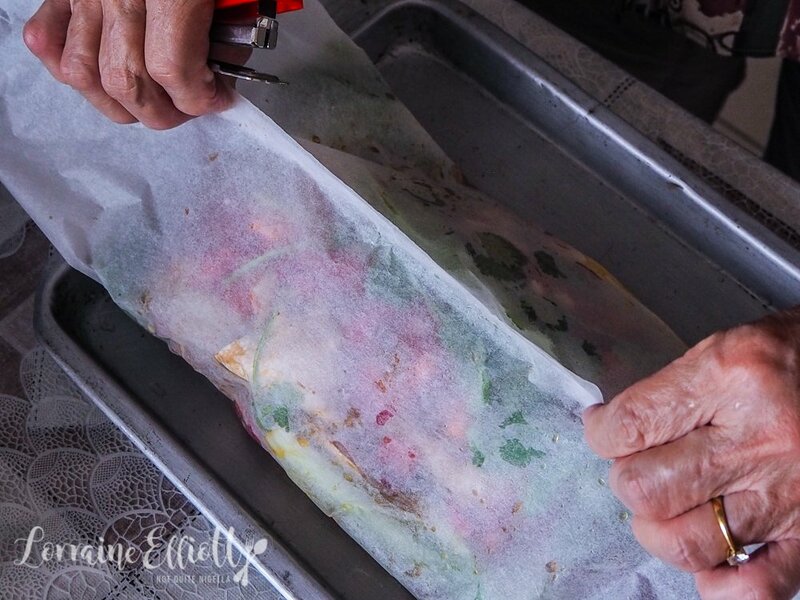 Step 1 - Tear off a large piece of parchment that can wrap around the fish (you will probably need extra large parchment for this) and place on a baking tray with at least 1 inch high sides. Preheat oven to 180C/350F. 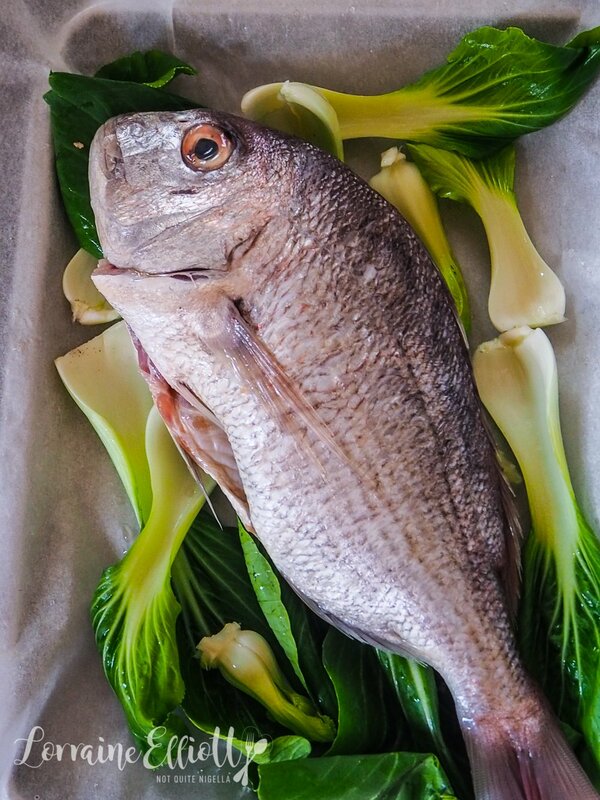 Cut the base off the pak choy and place individual leaves on the parchment and then place the snapper on top of them. Step 2 - Mix the chopped garlic with the finger, chillies and capsicum. 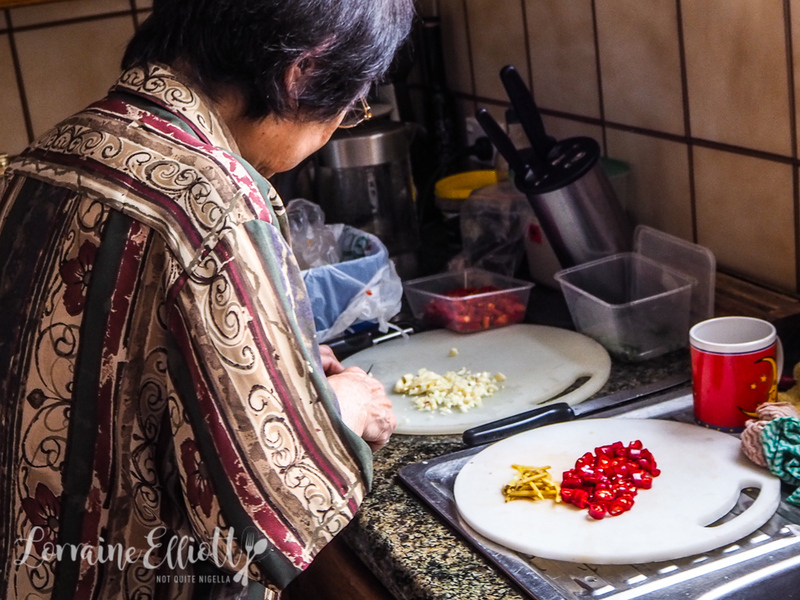 In a jug whisk the soy sauce, cooking wine, oil and the sambal terasi. Top the fish with the sauce and then the chilli mixture. 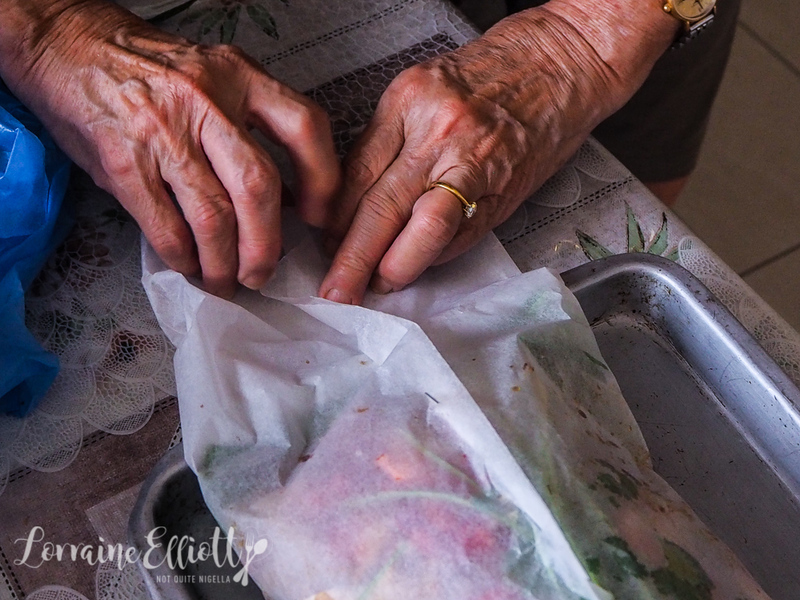 Staple up the parchment and fold the ends and bake for 30 minutes. Top with coriander and green onions.